Many of his musical works are so epic in scale, calling for massive forces and so sonically ahead of their time, that the composer held little hope of hearing some of them performed during his lifetime. “Berlioz had a vision for the future,” said Charles Dutoit, who leads the San Francisco Symphony and Chorus, soprano Erin Wall, tenor Paul Groves, and the Pacific Boychoir in Berlioz’s Te Deum, a grand, ceremonial work for chorus and orchestra, at Davies Symphony Hall February 6, 7, 9 and 10. The Te Deum perfectly captures Berlioz’s swashbuckling artistic spirit. The work calls for three choruses (two adult ensembles and a children’s group), tenor and organ soloists, and swollen woodwind, brass, percussion and string sections. Throughout the 50-minute piece, the choruses roar at each other and the heroic organ holds its own against the orchestra instead of playing with it. The overall effect is like that of proud armies facing off on the battlefield. Rehearsing and mounting a musical event with the scale and complexity of the Te Deum is a major challenge for any musical organization. Few are up to the task. But the success of recent performances of similar works that require the coordination and balancing of massive musical forces, such as Mahler’s Symphony No. 8 (Symphony of a Thousand) and Debussy’s Le martyre de Saint Sébastien, demonstrate the San Francisco Symphony’s particular affinity for bringing off such large-scale endeavors. Berlioz called the Te Deum the “brother” of his Requiem, the composer’s choral masterwork written twelve years earlier. However, unlike that staple of the symphonic repertoire, the Te Deum is far less frequently performed. The last time San Francisco Symphony audiences heard the piece was in 1973. 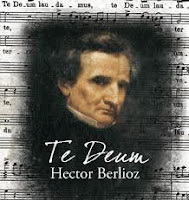 Yet the Te Deum is hardly an “also ran.” The tension inherent in the opposing orchestral and vocal forces, the spine-tingling tonal shifts and the emotional punch of Berlioz’s setting of the traditional Latin liturgical text–tweaked by the composer to heighten the work’s dramatic impact–all serve to make the Te Deum as spectacular in scope as its more famous sibling. The San Francisco Symphony’s February performances of the Te Deum may yet help fulfill Berlioz’s futuristic vision, and help this music find equal footing with the Requiem in the hearts and minds of audiences. Music makes a fine companion for any of these activities, whether you are looking for mp3 holiday gifts to give or music for yourself to listen to. Are you preparing for those big holidays -- Christmas, Chanukah, Kwanzaa, Winter Solstice? It’s never too early. Any training process is accompanied by the music and transferred much easier, because the music effects on our psycho-emotional state at peak capacity. I recommend to try music for sport highlights http://melodyloops.com/ which is my favorite.